(MCT)—I was looking at my home’s back steps, constructed of pressure-treated wood, and decided it was time for the annual get-rid-of-the-mildew-and-seal-them program. For some reason, they aren’t looking as green as they were last year, so the job will be a snap. It has been a long time since I discussed deck cleaning in this space, probably because these few steps are all I have taken since we sold the house with the deck 12 years ago. But because the summer entertainment season is coming, it might be appropriate to run through deck-cleaning 101 before the arrival of hotter weather, when things dry too quickly or not at all. If you don’t want to do the job yourself — especially if it has been a while since the last cleaning — there are companies that will do it for you. Go online or ask your friends and neighbors. 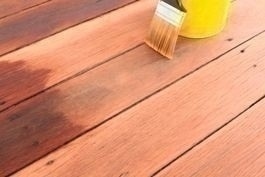 If your deck is in a spot where the sun always shines, it is highly unlikely that there is a lot of mildew coating the wood. You might need to just spot-clean and add a coat or two of waterproofing that needs 24 to 48 hours to dry between coats. At least three days of good drying weather should elapse between cleaning and coating the deck. A cloudy day is best for cleaning, because the deck needs to stay wet to thoroughly clean the surface. If it is too sunny or windy, the cleaner doesn’t have a chance to soak into the wood to do its work. If you haven’t cleaned the deck in a couple of years, you might want to rent a power washer, but check them out first and read the instructions when you get one. Be very, very careful if you’ve never used a power washer before. You can do serious damage to the wood if the spray is too hard or you lose control of the machine. What cleaner do you use? I’ve had great success with vinegar and water, as well as with diluted household chlorine bleach and with chemical-based cleaners you can buy in the store. I’ve also had luck with oxygenated bleach. From my experience in working in a Colonial-era burial ground, OxiClean and water easily removes mildew from centuries-old headstones. I mix whatever I’m using — a quart of white vinegar to four quarts of water, a 3-to-1 solution of water to bleach, or whatever is called for in the powdered or liquid chemical cleaner — and then let it sit for 10 minutes or so to settle. I choose an area about 4 feet square and apply the cleaner with a sprayer. Then I wait five minutes. To clean the area, I use a short-bristle brush that doesn’t dig into the wood. Next, I rinse the spot thoroughly with water, to stop the cleaning action, and move on to the next 4-by-4 area. If there are plants underneath or near the deck, either cover them with plastic or soak them with enough water to neutralize any cleaning solution, even if the manufacturer says the solution won’t harm plants. If you use bleach, wear old clothes. When I had a deck, I owned several colorful shirts with bleach stains on the cuffs. As a postscript, a recent e-mail from reader Sandy Allison says she’s had great success combating mildew with Wet and Forget, which is available at Ace Hardware. Finally, my neighbors have spent a large sum of money proving that aluminum siding can be successfully repainted. PA 19101. Volume prohibits individual replies.